Your posted comments are gems to us. Thanks. All the best in 2015, Carol! Lovely scene! I wish you and your family a happy & healthy New Year! wishing you health, wealth, peace and joy in the coming year and always. happy new year. Happy New Year Carol . May you and Art Muse Dog have a wonderful 2015! And thank you both for all the beauty and fun you have shared . I love the floating Christmas tree! Happy New Year to you and your family. That's a lovely photo! Wishing you A Very Happy New Year! May 2015 be the best yet. Happy New Year to you too Carol! Happy New Year to You and to Artmusedog too! 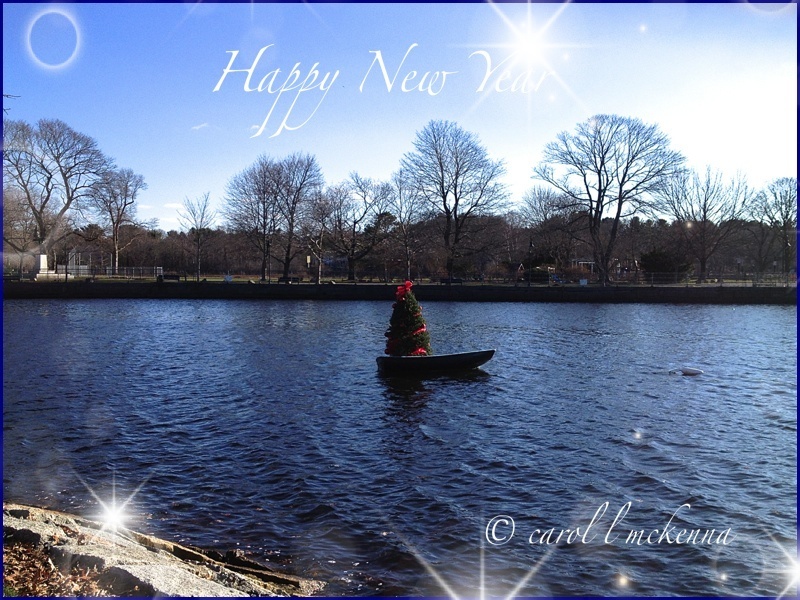 A Christmas tree on a boat... off the meet the new year? What a lovely shot! Wishing you and yours many good things in the coming year. I like the way your post 'grows', Carol. I came for Carpe Diem, HAPPY NEW YEAR to you and Art. I hope to return for letter "G". Great place to find a tree! happy New Year. and a very Happy New Year to you and yours too Carol! Beautiful. Best wishes to you as well. Magnificent photo, Carol! Happy New Year to you and Artmusedog! I wanted to stop by today to send along my best wished for you and your family in the year 2015. Happy New Year, and cheers. Happy new year back to you.. still another day. That's a first - I've never seen a Christmas tree in a boat before! Happy New year to you! A Happy New Year 2015 to you as well, Carol! I enjoy your posts! Have a fulfilling new year! It was probably there all the time but I missed it when I came from my poetry blog (Photo and Poem Place). Nice saying, very true. I know Art has that down pat, he is sooo clever a dog. Love the pic. And a very happy new year to you! A Christmas tree in a boat! Funny! What a great proverb. Is that a Christmas tree in a boat? I'm guessing it has had enough and sailing away until next Christmas. Neat post! Wishing you the best in the new year as well! Every comment and word are gems. Every laughter the best medicine. Nice picture! Wishing you and all the best in 2015! I hope your New Year is filled with love, light, and joy! Thank you for sharing the beauty of your wonderful area!